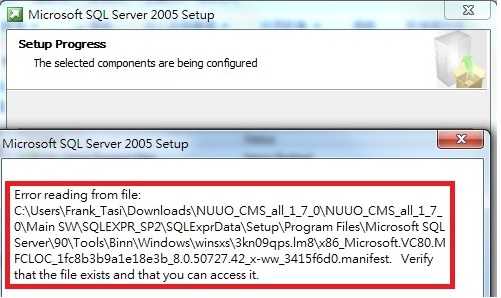 The error message "Error reading from file" popped up when install SQL server 2005 during the setup progress. The maximum characters of Windows system folder path is 260 characters. If the character length of NCS package folder path is over than 260 characters when you execute the Setup.exe, the message will pop up. Move the NCS package folder to other shorter path folder. For example, you can move it to another hard drive direction such as D: /test/. How can I setup popup live video window in NCS client?